In 2012, the city of Saint Lambert began renovating Riverside Street, one of its lifeline, as many underground infrastructures dated back to 1913. Planned in 3 phases between 2012 and 2017, the goal was not only, to reduce through traffic arriving from highway 132 to Riverside, but also, to embellish the surroundings. Total estimated cost for the project was $43.2 million. For a total of 9km, this project also includes 3km of surrounding avenues (Saint-Denis, Edison, Hickson, Du Rhône and D’Anjou) and allows for the redevelopment of Riverside Street. Narrowing the roadway to just 1 lane on each side (from 12 to just over 8 meters), will reduce the speed of the vehicles. 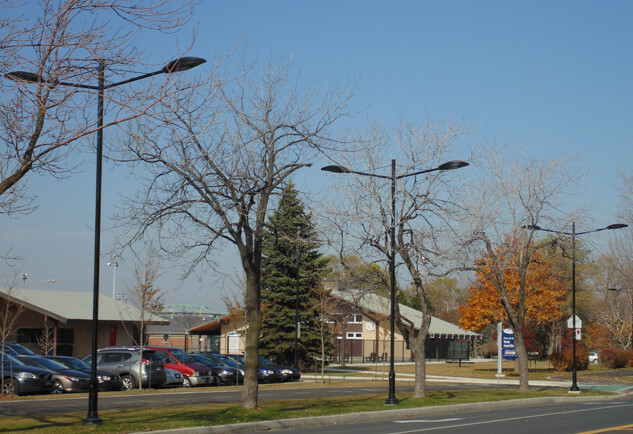 ‘’We want to give the street back to its residents’’ says Georges Pichet, Director of the Land Use in Saint-Lambert. The reconstruction enables the City to conform its bicycle path, from 2.6m to 3m. As for the sidewalk, it will be larger (from 1.2 to 2m) and include a green planting strip. This will give pedestrians a greater sense of security. Bus shelters and landscaped areas will also be added. The lighting project of Riverside Street is particularly complex as it aims to upgrade the lighting system, as well as modifying the street’s vocation, by improving the environment of nearby residents while ensuring the safety of motorists, pedestrians and cyclists. The challenge of the technical proposal laid in the difficulty to meet the requirements of lighting and uniformity levels, while respecting the aesthetic and architectural character of the product and ensuring a maximum spacing streetlights. Maximize the spacing ensured the competitiveness of the financial offer. Other technical elements such as the pole, the dimensions, the normative requirements or source are all available or intrinsic characteristics to the standard offer of Quattro. Several iterations were performed on a photometric level to meet the minimum requirements of the specification and MIS100S and ADL200 models were preliminarily selected. 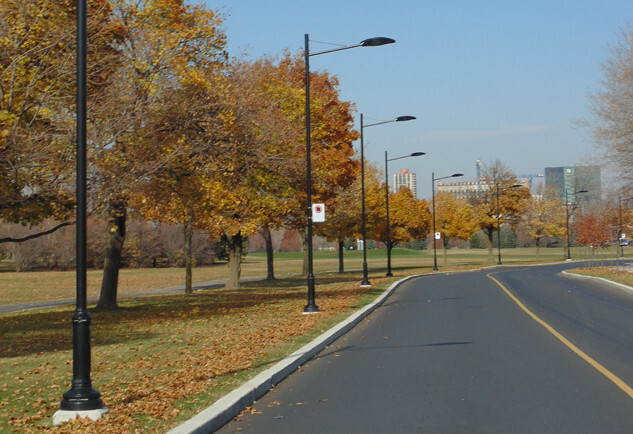 Two choices of lighting fixtures have been proposed with 3 spacing scenarios: 24 m as required in the specification, 27.5 m with horizontal luminaries and 30.0m with 10 degrees inclined luminaries. The photometric analysis allowed us to validate our lighting concepts and ensure we met the basic standards set by the IES as well as the quotation requirements. The results of photometric studies were analyzed and a final solution was presented to the city council. It turned out that all the options considered met the required photometric level. Nevertheless, the scenario of the ADL200 luminaries tilted at 10 degrees offered a significant performance advantage and profitable commercial aspect. 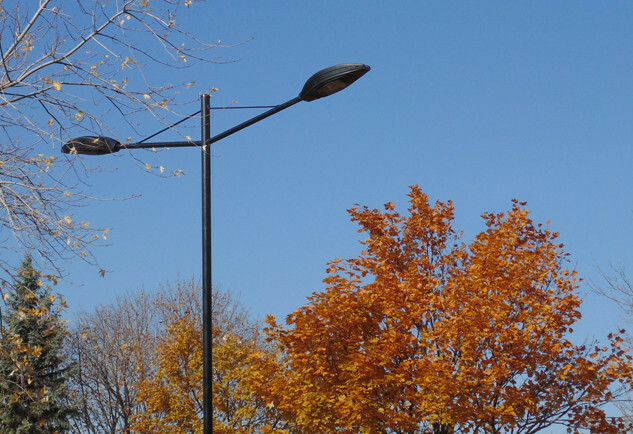 The optimal solution proposed by Quattro thus allow to reduce the number of lamp posts by 15% making this much more economical and with an increased level of security.